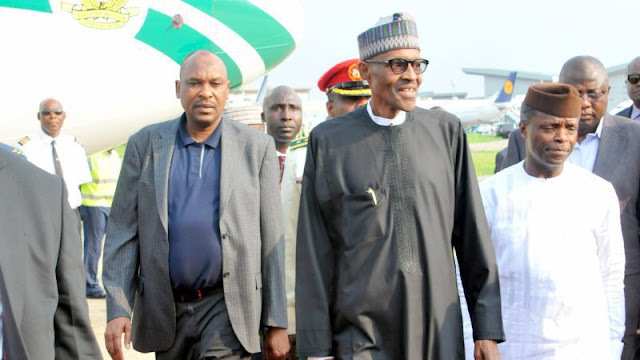 The Nigeria President, Muhamadu Buhari plane landed in Abuja today, Saturday 19, after spending 103 days in London on health leave where he received medical treatment for an undisclosed ailment. Mr. Buhari’s prolonged absence has generated concerns, debates, protests in recent days that sparked fighting between Mr President supporters and the group #ResumeOrResign campaign for Buharis return. During his stay in the United Kingdom, Vice President Yemi Osinbajo acted as president. Mr. Buhari travelled via Abuja’s Nnamdi Azikiwe International Airport and received by the vice President, Professor Yemi Osinbajo, fact minister and other high ranking ministers and politicians. There was jubilation along the Umaru Musa Yar’adua express way, also known as Airport Road, Abuja welcoming the President back to the country.